Dating apps have quickly become some of the most lucrative social apps in both the Apple App Store and Google Play. In fact, the Financial Times reports that Tinder, one of the top revenue generating dating apps, brings monthly app revenues of $30M-$35M. 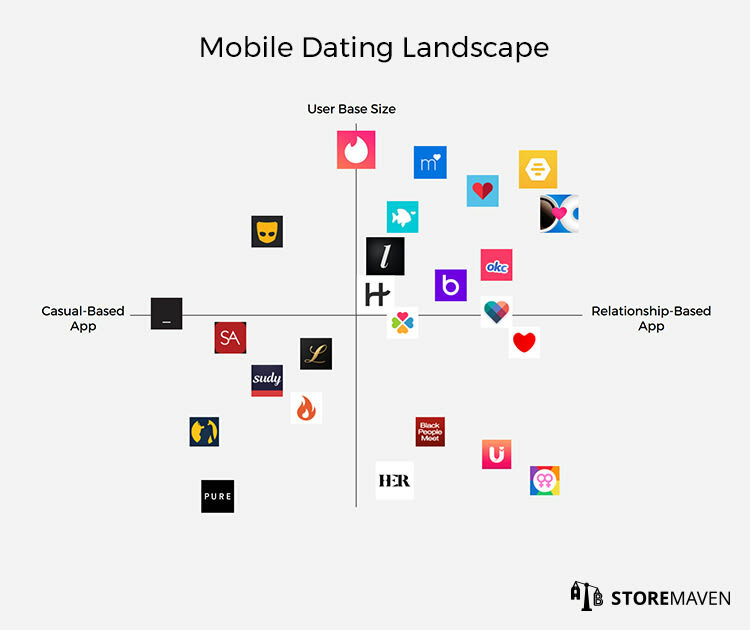 However, the current mobile dating landscape is saturated with competitors, both niche and more broadly targeted apps, who are eager to grab their own piece of the revenue pie. Based on our experience working with leading companies in the dating industry, we’ve found that the average conversion rate (CVR) in the dating category is between 13-18%. This means that around 82-87% of visitors land on your page and decide not to install. 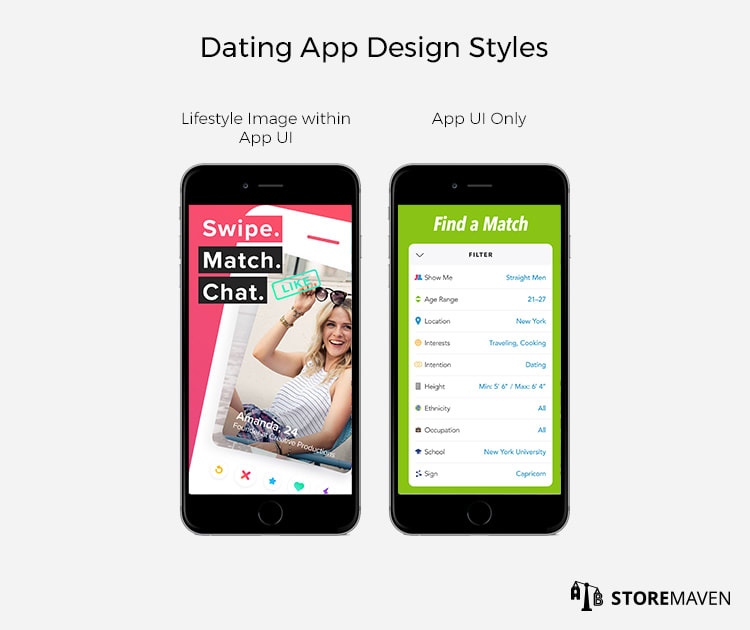 The most effective way to cut through the clutter and differentiate your dating app from others is to constantly test your creatives and messaging with target users through App Store Optimization (ASO). Our data has shown that optimized app store creatives can increase your conversion rates by up to 40% for both paid and organic traffic. 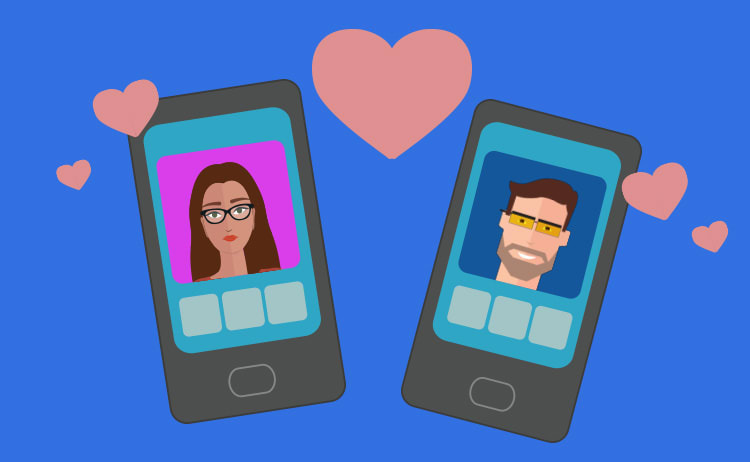 We’ve worked with some of the top mobile dating publishers and used our internal databases, generated by analyzing the behavior of more than 500 million users in the App Store and Google Play, to uncover actionable and valuable ASO tips for dating apps. Relationship-based: apps that are mainly used to find meaningful relationships. Casual-based: apps that are mainly used to find “hookups” or other casual, non-romantic relationships. While these are common metrics for all apps in the dating industry, understanding this initial segmentation provides you with insight into where there is high saturation and who your direct competitors are. This allows you to identify key opportunities for differentiating your app through the assets in your app store page. 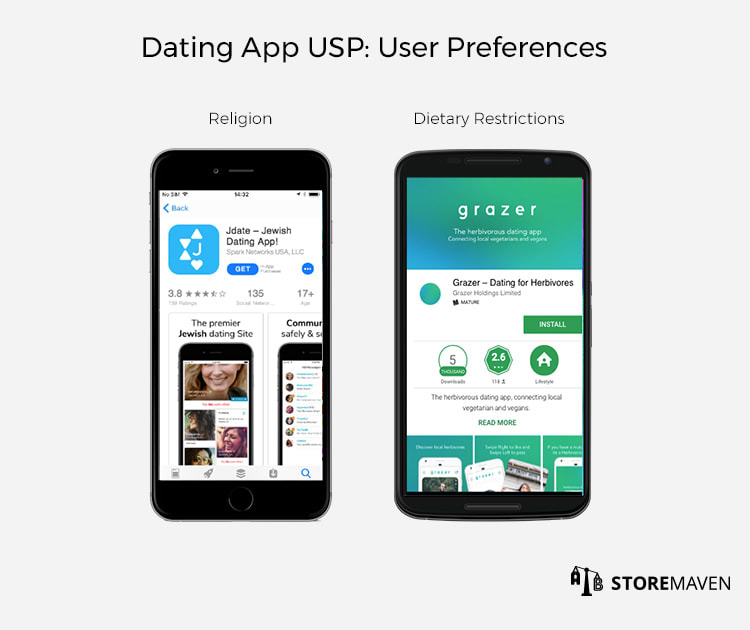 Now that you have a general sense of the dating app industry and where your app lies on the spectrum, you need to define your app’s USP. This will influence the messaging and creatives you test in your app store page. The first category is User Preferences: Does your app target specific users with unique or niche characteristics or interests (e.g., gender, age, religion, locale, dietary restrictions, etcetera)? 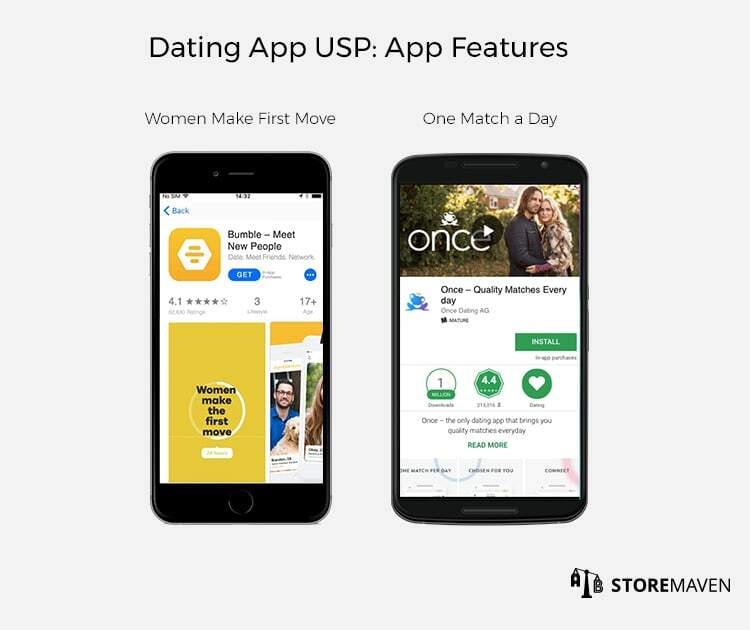 The second category is App Features: Does your app have specific features, functionality, or values that are unique (e.g., Bumble only lets women initiate conversations, and Once only provides one match a day)? Depending on what you’ve identified as your app’s point of difference, you can begin to design and optimize app store assets and messaging to match the USP. The first style is Screenshots that incorporate lifestyle imagery (e.g., real-life photos of people you can match with in the app) within the app’s UI. The second style is Screenshots that showcase the app’s UI without the presence of lifestyle images. With dating apps, you’re selling an experience and the idea of finding an emotional connection. This is why we’ve found that incorporating lifestyle images within app UI screenshots is the most effective. It gives visitors a realistic sense of the people they may meet through your app and helps foster a stronger emotional tie to your brand. To learn more about Screenshot design styles, read this. Our data has shown that the visitor explore rate for dating app store pages is between 25-35%. Apps that manage to drive visitor exploration and then convert these visitors enjoy a competitive advantage. This is where developing a strong ASO strategy becomes an integral part of success. The First Impression Frame (everything above the fold) is important real estate to show visitors exactly what your app can offer them as soon as they land on your page. With just 12% of visitors scrolling through Gallery assets, it’s crucial that your top USP(s) are included above the fold and in the first few Screenshots for immediate visibility. In the example above, Hook Up Dating uses its app title and Screenshot captions to immediately show visitors it’s a casual-based app strictly for hookups. In comparison, Coffee Meets Bagel makes it clear through the short description, Screenshot captions, and Feature Graphic that they help users make quality connections. Localizing and culturalizing your app can greatly enhance its global visibility and boost CVR. Beyond translating your app to different languages, it’s important to research and identify the most popular dating apps in each country you’re trying to target. This gives you insight into what concepts appeal to locals in specific regions and how competitors use their app store assets (i.e., what messages they include in captions, how they showcase their app’s functionality in the Gallery, etcetera) to attract users. It also helps you identify subtle cultural nuances that are otherwise hidden. The ASO Tool Box Chrome extension can help you with this type of competitive research. France – In dating, it’s common for women to make the decisions. The AdopteUnMec app uses this insight and gives women the power to pick a man. They make it especially clear by showing the image of a potential male match in the second Screenshot. Russia – Russians respond well to chic-looking selfies and, somewhat surprisingly, creative assets that involve cats or cat videos. This insight is evident in Mamba’s First Impression Frame in which a high-end photo of a woman is front and center, coupled with tiny cat emojis peeking out from the second Screenshot. United Kingdom (UK) – Even though the app store is in English, eharmony’s Screenshots have been localized so the location of each potential match is a UK city instead of a U.S. city. This helps users connect with the app on a more meaningful level. Many countries share the same language, but this creates a false illusion that they can be treated as one unit in marketing terms. 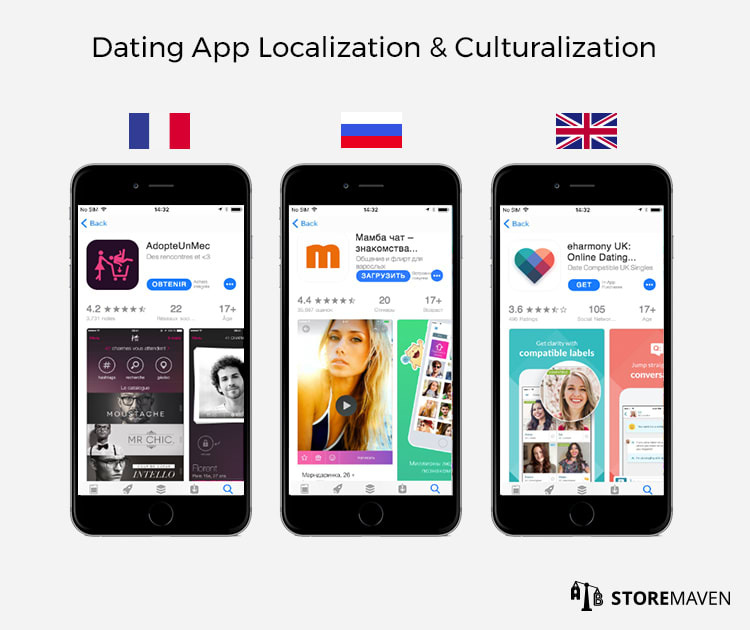 Read more about best practices for localizing and culturalizing your app. The time of year can largely affect what your users respond well to. For example, during summer months, users may be more receptive to images showcasing outdoor dates. During winter, and more specifically the holiday season, visitors may want to see more direct messaging about finding relationships and companionship during the holidays. Learn how holiday and seasonality marketing strategies can greatly impact your app store here. 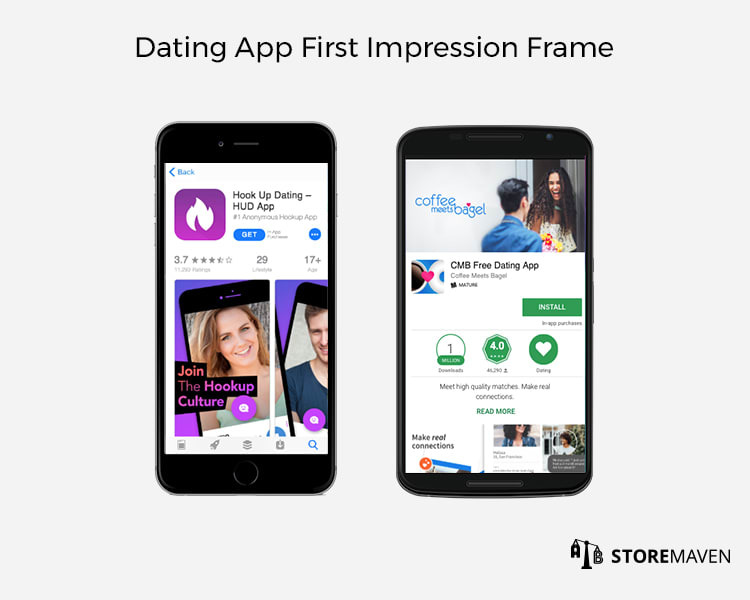 The dating app industry attracts millions of users around the world, so it’s important to consistently test and optimize your app store page to stay relevant and attract quality users. Test the first two Screenshots, and make sure that the unique value proposition that you offer shows up in the First Impression. You can also test using men’s profiles to show potential female users the supply in order to build demand. By optimizing Screenshots, you can potentially boost CVR by 28%. Test different messages in both the Apple App Store and Google Play. We’ve found that using the same creatives on both platforms can actually lead to a 20%-30% decrease in installs on iOS. If visitors aren’t watching your Video or scrolling through your Gallery assets, focus your creative effort on testing different designs that will encourage exploration. If visitors are immediately dropping from your page, focus on optimizing different elements and messaging strictly within the First Impression Frame. 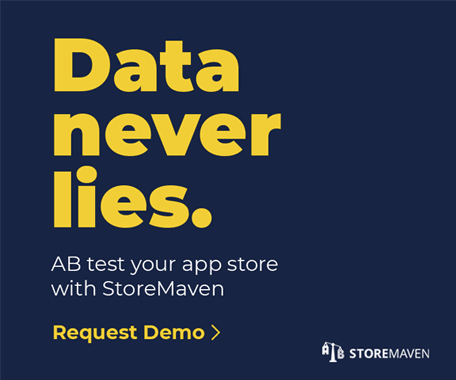 If you’d like to start building your ASO strategy and understanding visitors’ behavior on your app store, drop us a line at info@storemaven.com.